Pre-wedding photo shoot...since when did this trend started and why has it become a 'must-have' for most couples getting married these days? The amount of money that couples are willing to spend on bridal photo shoots are so exorbitant (usually the 2nd largest expense after the reception) that pre-wedding shoots are now a seriously big business in the wedding industry. 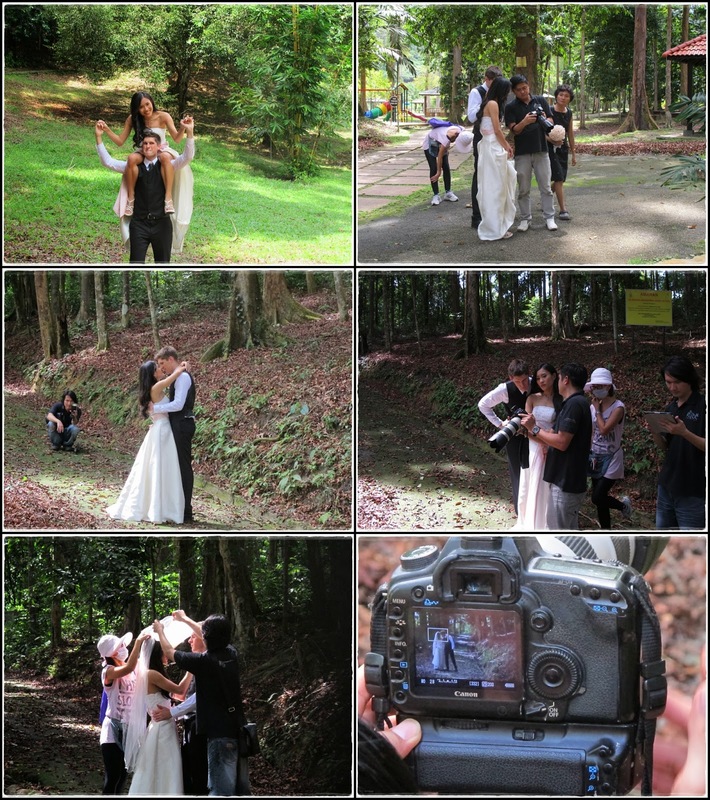 Honestly, I wasn't keen on spending so much money on a photo shoot but our main purpose of doing this wedding was to celebrate our love with our families and a nice wedding photo album would be a good keepsake for our families coz we know that either of us would move far away from home eventually. Bridal house or freelance photographer? 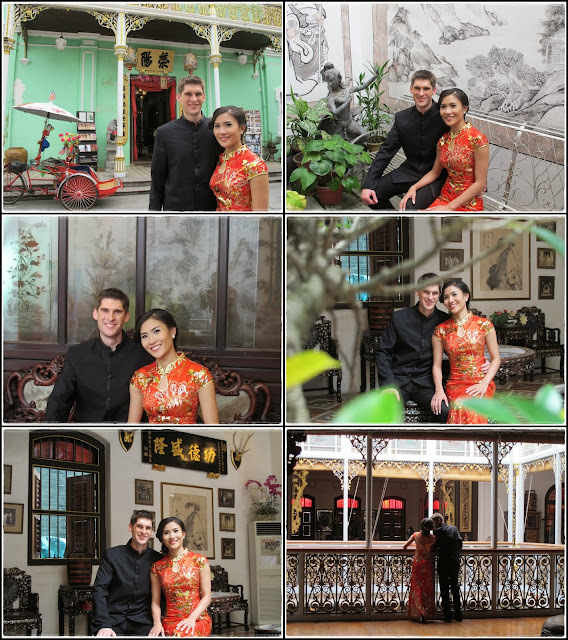 Right after confirming our wedding date, we started researching online for pre-wedding photo shoots. Initially, I was thinking of just getting a freelance photographer to do some casual photo shoots, more like the ang-moh version of 'Engagement Shoot' whereby couples dress up more casually and do it at outdoor grassy places coz I thought it would be cheaper and easier than taking a bridal house package and dress up in wedding gowns. However, after comparing the prices and what they offer, we decided on the bridal house package which turned out to be cheaper and less hassle. Even though freelance photographers may seem cheaper at first, they usually don't include make-up/hairdo, wedding gowns and anything on your wedding day. 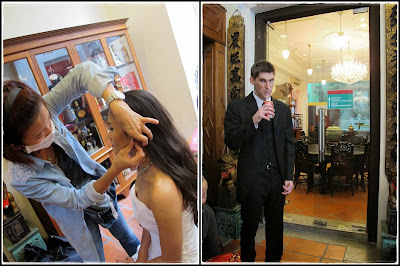 Of the many bridal houses in Penang, it wasn't easy deciding which bridal house to use. Based on bro and SIL's experience with their pre-wedding photo shoot, I've learned that if you get a package that's much cheaper than others, then most probably there'll be all sorts of hidden costs. I was lucky that the first bridal house that I approached (KYBC) gave me a pretty good impression and I liked the fact that they were pretty flexible. The first thing I asked was whether they are able to get the photo shoot and album done within 3 weeks coz that's all the time we had. Since it was still 10 months away from the wedding, they are able to work around their resources to ensure that it's done before our wedding day. Instead of pushing me to book their packages as it is, the boss asked what I wanted and my budget then she worked out a price for me and gave me few days to consider. 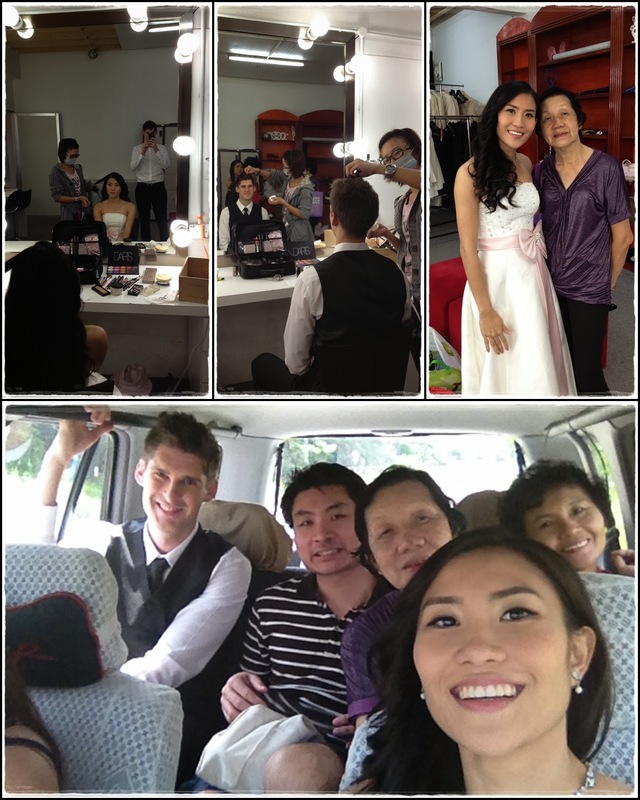 At the end of the day, we settled with a 'pao-ka-liao' package that includes 4 locations, 3 sets of gowns and suits for the photo shoot, make-up & hairdo, 2 gowns and suits for the wedding day, flower bouquet, car ribbon, 2 photo albums, and a slideshow DVD at a pretty reasonable price. Best of all, there were no hidden cost. =) P.S. I don't get anything for promoting them but I just wanna say that good customer service makes a whole world of difference. Since there weren't much that we could do before Daniel got here in December, he helped to do some research on the internet and shortlisted some poses from others' photo shoots. The funny thing about pre-wedding shoot is that you are forced to do stuff that's not really 'you'. It's pretty obvious that we're not professional models but we had to act and pose like we were, and be natural about it. Worse still, we had to do it in public, this is really some serious public display of affection (PDA)...lol!! Believe it or not, we actually practiced some poses before the photo shoot day just so that we didn't look too awkward coz no matter how fancy or beautiful the dress is, if our pose is awkward then it's gonna ruin the photos and our few thousand bucks will go to waste. All ready to get started! This dress can only be used in their studio, that's why we decided to do one set in the studio. No cameras allowed so no b-t-s photos for this set. =P We started around 11.30am and the first set went pretty well so we were done in an hour. Our photographer (Ah Hooi) and his assistant (Jason) was really skillful and helpful. We showed them some photos that we shortlisted online and they tried their best to accommodate our requests and made us feel comfortable posing in public...haha!! Another location done within an hour. Time to change into the next dress and change my hairdo for the next location. Another uniquely-Penang location - Blue Mansion. This place collects a fee of RM250 for photo shoot but Daniel loves this place a lot so we didn't mind paying for it. Outdoor locations are definitely much better for photos because of the natural light. We were supposed to be done with our photo shoot in a day but thanks to the rain, we couldn't complete our final set of photo shoot at the botanical gardens so we decided to do the last set on a different day at a different location. Thanks to big bro and SIL for taking all these b-t-s videos during the photo shoot and bro for putting them all together in this video clip together with the R.O.M. Now that you've seen what went on behind-the-scenes, it's time to see the end products. We're both very satisfied with how the photos turned out and it seems like we've got some talent in posing...lol!! Basically all we did were...look at each other, look away in the distance, eye-to-eye, nose-to-nose and kiss...hahaha!! 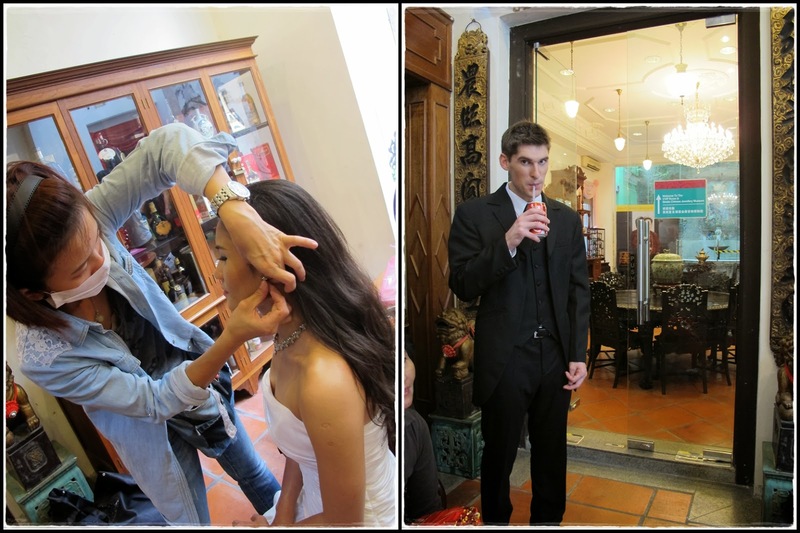 Anyway, full credits to KuangYee's photographers (Ah Hooi & Jason) and make-up artist (Ivy) for the job well done.